The arrival of Capewell Lofts may just be the grandest opening in Hartford yet. These are lofts in the truest sense of the word. Soaring high ceilings. Surfaces and details that reflect timeless character. Exceptionally modern finishes and amenities. All in a location that makes absolutely everything convenient to you. Plus, you can feel good knowing you live in a sustainable, eco-friendly building – built to Gold LEED standards. You are invited to come see these magnificent spaces and make one of them your own. Explore the neighborhood, Downtown Hartford and beyond. 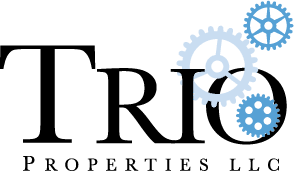 After all, you are within walking distance to Hartford Hospital, Bushnell & Colt Park, Constitution Plaza, Front Street entertainment, local eateries and everything Downtown for culture, education, and entertainment. It's all just out your new front door. Just south of downtown, this Riverfront park features a dock for excursion boat service as well as a public boat launch. Spend some time fishing in the Connecticut River. Take a walk along one of our paved and lighted river walks, or pack up a basket and enjoy a family outing in picnic areas complete with tables, a children’s playground and public restrooms. The parking is free; the beauty is priceless. Come where the music is live, the tastes are sensational and the choices are bigger by the block. In the Front Street District, you can dine, dance and do it all! Discover Hartford’s new hub for entertainment, excitement and energy. Parking is easy, with two new, low-cost garages on both sides of Front Street. And every kind of fun is all walking distance. Today, we continue to serve as an “anchor” in Hartford’s Sheldon/Charter Oak neighborhood along with our magnificent Polish church, SS. Cyril & Methodius. Since opening its doors to the public in 1844, the Wadsworth Atheneum has paved the way for encyclopedic museums across the country, and has a rich legacy of Firsts. It was the first museum in America to purchase works by Caravaggio, Frederic Church, Joseph Cornell, Salvador Dalí, and Joan Miró, and was the first in the country to exhibit major surveys of works by Italian Baroque masters, Surrealists, and Picasso. Progressing Daniel Wadsworth’s vision, the museum’s collection has grown to hold approximately 50,000 works of art that span 5,000 years. Highlights include the Morgan collection of Greek and Roman antiquities and European decorative arts; world-renowned Baroque and Surrealist paintings; an unsurpassed collection of Hudson River School landscapes; European and American Impressionist paintings; Modernist masterpieces; the Serge Lifar collecton of Ballets Russes drawings and costumes; the George A. Gay collection of prints; the Wallace Nutting collection of American colonial furniture and decorative arts; the Samuel Colt firearms collection; costumes and textiles; African American art and artifacts; and contemporary art. The Wadsworth Atheneum underwent a major renovation from 2010 through 2015. The $33 million project renewed the museum’s historic structures and added 17 new gallery spaces—nearly 16,000 square feet of exhibition space—to the building’s existing footprint for an improved visitor experience. The Grand Reopening on September 19, 2015 was a seminal moment in the museum’s storied 173-year history. Major exhibition openings and newly refurbished collection galleries dazzle patrons while new interpretive content and interactive technology encourage deeper engagement with the artwork. Completion of the project means that now, for the first time in nearly 50 years, all galleries are simultaneously open for public exploration. As the premier park central to the core of the City of Hartford, Bushnell Park was indeed the visual point of reference for the City from 1860 for three decades of intense use and pleasure, through the 1890s. The Bushnell Park area was an eminent domain acquisition about the same time that South Green (Barnard Park) became park land by assumption, after decades of use as an historic common. The Park was one of the earliest public parks in the nation to be planned and built by a municipality as a graceful pastoral landscape rather than a formal European garden or New England square. It has been an important gathering place, recreation ground and green city space for over 130 years. Perhaps as important, the park serves as the landscape setting for the State Capital. The park was listed on the national Register of Historic Places on October 22, 1970. Enriching, illuminating, energizing, and delighting the spirit of the community has been The Bushnell’s constant mission. Today, The Bushnell, a 501(c)(3) not-for-profit, is the State’s largest arts organization and has been deemed a “Connecticut Cultural Treasure.” Experience The Bushnell – past, present, and future – in the video below, beautifully produced by CPTV. Charter Oak Cultural Center, a beautiful historic landmark and vibrant non-profit multi-cultural arts center, doing the work of social justice through the arts. Charter Oak Cultural Center harnesses the power of the arts…to create positive social change, loving community and a safe place for self-expression. Located in a historic building, we present multi-cultural arts programming that we make accessible for free or at a very low cost, we provide completely free classes in the arts to 1000 underserved Hartford young people, work extensively with the homeless community and present performances and exhibits that bring to light the burning issues of our day. Commodore Caldwell Hart Colt, Mrs. Colt’s only child to reach adulthood, drowned mysteriously in Florida at the age of 36 in 1894. Edward Tuckerman Potter (also architect of the Twain House in Hartford) was brought out of retirement to build a “companion building,” 30 years after his work on the church. It celebrates the world, creation, nature, and the sea. Caldwell was a yachtsman who traveled the world on his ship, “The Dauntless.” This building, with “WELCOME” inscribed over the front door, captures the image of a ship: with portholes, symbols of the sea, and vocational themes. It expresses the grief of a mother whose love could not be quenched by the waters that drowned her only adult son. With an attraction of this magnitude, exhibits rivaling the most unique in the world, programs with the potential to become national models, partnerships with a range of educational organizations, and involvement from global business leaders and benefactors, the Science Center is Connecticut’s premier destination for informal science learning, and is well on its way to becoming the state’s foremost Science, Technology, Engineering and Mathematics (STEM) resource. Opened in 2003, our museum features The Aetna Gallery permanent orientation exhibit, “I have sampled this life”, a video introduction by acclaimed director Ken Burns, rotating exhibits on Twain’s work and influence, two classrooms and a 178-seat auditorium for special programs. Admission to the Mark Twain House is by guided tour only. Ticket prices include the tour of the house and admission to the museum center. Tours do sell out! Advanced online purchase is recommended. Web sales close several hours before each tour start time. Any remaining tickets are sold at the door first-come first-served. We now offer LIVING HISTORY TOURS on a weekly basis! Step back in time and view The Mark Twain House & Museum through the eyes of a family member or servant. For more details, click here.Reservations are best for group tours. Discounts are available for groups of 10 or more if booked 14 days in advance. If you wish to tour both The Mark Twain House and the Harriet Beecher Stowe House, a discount is available. Please click here for more information. Let’s GO Arts! cardholders are eligible for a $2 discount on regular tours of the Mark Twain House. (This discount does not apply to specialty tours, such as Graveyard Shift, Clue, and Living History tours.) Present your card at the ticket desk to get your discount. If you have any questions about tours, please call (860) 247-0998. *Does not include the tour of the Mark Twain House. Iconic Hartford Square North, known by locals as the Candy Cane Building because of its unique striping and architectural details. Connecticut — an easy day’s drive from New York City — shows its brightest colors in October. Best places to visit are the wooded areas of the state, like Litchfield, and the eastern Mystic region. All these places have delightful small towns and gorgeous scenic drives. The Connecticut Wine Trail welcome guests to wineries and vineyards that host harvest season events and tastings. The capital city of Hartford has a beautiful city park, Bushnell Park, and the larger and more rugged East Rock Park. See useful information about when to visit, how to find color, and what to wear and pack HERE. This drive will take travelers past the Housatonic River, famous for fly fishing and white water rafting; near two covered bridges; and through Kent and its many art galleries, historic homes and churches; Washington and its Institute for Native American Studies, and Mount Tom State Park. The Appalachian Trail passes through this area, and opportunities for day hikes are plentiful. 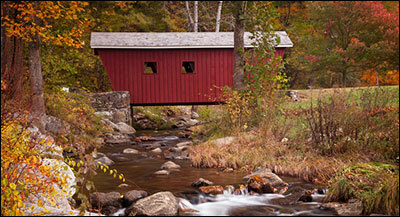 ♦ Two covered bridges in the area are Bull’s Bridge in Kent and Kent Falls Bridge in Kent Falls State Park. Bull’s Bridge is a historic bridge, built in 1842; the Kent Falls bridge is a 1970s-era re-creation of a historic structure. ♦ Morrison Gallery on Old Barn Road in Kent. See interesting changing exhibits of modern art, photography, sculpture and more. Also, check out Heron American Craft Gallery on Main Street in Kent. Great for gift buying: art, household decor, ceramics, clothing and jewelry, greeting cards. ♦ Iron Mountain Preserve, Treasure Hill Road, Kent. Stop for a 1.5-mile walk on a loop trail through varied forest and woodlands. Your host is the Nature Conservancy. ♦ The House of Books on Main Street in Kent is packed with high-quality literature; a whole rooms of children’s books; cards, music and gifts. The town is on the Appalachian Trail and the store specializes in maps, trail guides, books on local lore and the out-of-doors. ♦ Travel a few miles north on Route 7 beyond Calhoun Corners, through Housatonic Meadows State Park, and into Cornwall to see the West Cornwall covered bridge, which carries Route 128 across the Housatonic River. 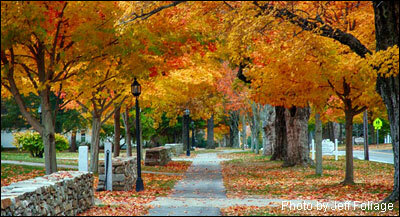 This area is famous for its great fall foliage, too. ♦ Mount Tom State Park in Litchfield. Swimming and boating in the lake, hiking to a fire tower 1,325 feet above sea level. ♦ Institute for American Indian Studies, 38 Curtis Road in Washington. Visit this museum to learn about the area’s first human residents. See the sachem’s house classroom, children’s discovery room, replicated Algonkian village, simulated archaeological excavation site. ♦ Kent Coffee and Chocolate Co. on Main Street in Kent. The cure for low energy, before or after a glorious hike in the Litchfield countryside. Come enjoy and take home gourmet chocolates and handmade desserts and truffles. Lots of interesting coffees, teas, and smoothies. 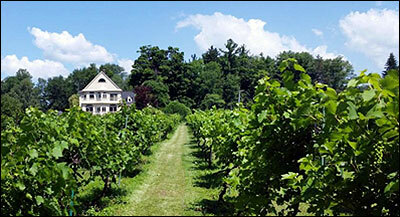 ♦ Haight Brown Vineyard, Chestnut Hill Road in Litchfield. Set on 10 acres of pristine farmland, this hospitable vineyard offers winery tours, self-guided vineyard walks, wine tasting, classes, and lots of seasonal special events. There’s a wine and gift shop; and a cafe serve light meals on weekends. ♦ Eateries in New Milford show great range: there’s the German-cuisine Alpenhaus Restaurant, serving pirogies, pretzels and potato pancakes; The Cookhouse, featuring hard-core barbecue; and the Three Brothers Greek Diner, with reports that the slice of carrot cake they give you is as big as your head. This drive passes through many lovely small towns and the adjacent Peoples State Forest and American Legion State Forest. Also near this drive is Lake McDonough, a scenic, unspoiled public recreation area. ♦ People’s State Forest and American Legion State Forest, Barkhamsted. These two adjacent state forests are located along the west branch of the Farmington River. There are lots of places for picnicking. Check out the forests’ trail map and take a walk. ♦ Lake McDonough Park, Barkhamsted. Stop for a picnic or a hike on a trail. ♦ Warner Theater in Torrington. Leaf-peaking is a daytime activity, obviously, but if you are staying in the Litchfield Hills of a long weekend, find out what’s going on at this historic theater. The fall, 2016, calendar, for instance, includes musicals, comedy, and the Metropolitan Opera in HD. ♦ Infinity Music Hall in Norfolk. Echoing the comment above, if your trip through the beautiful towns and farms of Litchfield keeps you overnight, the Infinity Music Hall is a dynamic place that brings in lots of interesting, national-caliber entertainment. ♦ Thorncrest Farm & Milk House Chocolates in Goshen is on the state’s Chocolate Trail. Calling itself The Home of Single Cow Origin Chocolates, Thorncrest serves chocolate in all the divine ways we have come to know and love. ♦ Jerram Winery in New Hartford is on Connecticut Wine Trail of wineries and vineyards that open their doors to tours, tastings, and sometimes classes and celebrations. — This loop is good for people with limited time to spend. With only short stops for viewing the scenery, the trip should take less than two hours. Black Rock Park offers excellent hiking, scenic views, and Indian legends. People with more time to spend should visit Waterbury’s Mattatuck Museum, with exhibits chronicling the industrial and cultural history of the Naugatuck Valley. The Last Green Valley is the 35-town National Heritage Corridor in northeastern Connecticut. It is a pristine and quiet spot of pretty town greens, country roads, wildlife preserves, unusual farms (alpaca, bison), wooded walking paths, calm waterways for paddling, history museums, towns with galleries and good food. Star gazing is popular; the last Green Valley is one of the few places on the Eastern Seaboard with little nighttime light interference. ♦ The general scope of this drive is from Norwich to Woodstock, following Route 169, with plenty of side trips for nature viewing, shopping, walking, and dining. Norwich is an old city on three rivers. People who love interesting Colonial architecture should walk past the homes, schoolhouse, shops, and taverns on the Benedict Arnold walking trail. .
♦ Connecticut Audubon’s Grassland Bird Conservation Center at 218 Day Road in Pomfret Center. Walk from dawn to dark, year-round, at the Bafflin Sanctuary or the Trail Wood Sanctuary. It’s all about the birds. ♦ Brooklyn and the Brooklyn Green Historic District. This classic Connecticut town green is a beauty. Most buildings in the district date from 1750 to 1850. ♦ Taylor Brook Winery on Route 171 in Woodstock welcomes guests Fridays through Sundays for tastings, self-guided vineyard tours, picnicking on the property, and a chance to buy cheese, sausage, crackers, dips, and other treats to enjoy with your wine. ♦ Driving west out of Brooklynon Route 6 takes you to the James. L. Goodwin State Forest in Hampton, where you can take a walk on the many trails around Pine Acres Lake or visit a native plant wildlife garden. ♦ Alpaca Obsession in the town of Moosup raise alpacas and angora rabbits and sells related products. Be sure to call ahead before visiting. ♦ Woodstock is stocked with shopping that you won’t find in a big-box store. Pop in at any of these spots: Coco’s Cottage (women’s clothes and accessories, gifts for baby); Garden Gate Florist Gift Shop (antiques, jewelry, plants); Mrs. Bridges Pantry (tea supplies, food from the UK, gardening items); Periwinkles at Garden Gate (gift shop); Scranton’s Shops (antiques in a historic blacksmith shop). ♦Sweet Peas Fine Foods; Farm Market on Providence Road in the Baker’s Dozen complex in Brooklyn serves upscale take-out food, prepared meals, salad bar, quick cuisine, Venda Raviloli products, bakery goods, cheese. Perfect for a healthy and delicious picnic. ♦ The Stomping Ground on Main Street in Putnam is a friendly local hangout with good lunches and dinner, live music nightly except Mondays and Tuesdays, and open mic nights. ♦ Golden Lamb Buttery in Brooklyn is for special occasions or maybe just a feeling that it’s time to splurge, Serving lunch, and dinner on weekends. Enjoy cocktails on the porch overlooking a pastoral scene and a wonderfully prepared meal. 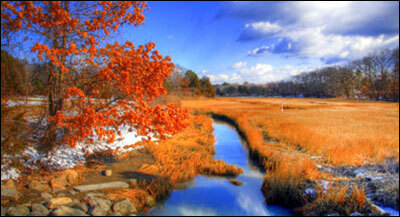 — This drive along the tidal Mystic River, with its marsh meadows and waterfowl, is beautiful all year. From River Road, views of Mystic Seaport on the opposite bank of the river convey a shipbuilding community in the early 1800s. Downtown Mystic is a delightful place to explore. 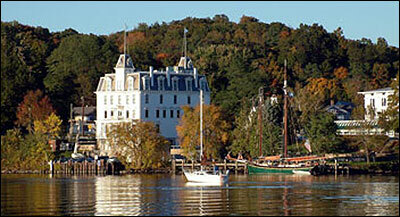 ♦ Mystic Seaport, 75 Greenmanville Avenue, Mystic (860-572-5315). Marvelous living history museum and re-creates a 1830-period New England ship building village similar to historic towns of this area. Lots of season special events celebrating coastal New England history and culture. Great fun for adults and kids. ♦ Mystic Aquarium and Institute for Exploration, 55 Coogan Blvd., Mystic (860-572-5955). Wonderful aquarium includes Beluga whale exhibit and Titanic exhibit developed with help by Dr. Robert Ballard, discoverer of the sunken ship. — This route runs from Canterbury to Woodstock in the northeastern part of Connecticut known as the Quiet Corner. About 190 pre-1855 homes survive along the highway, as well as historic churches and farms. The highway winds through the towns of Lisbon, Canterbury, Brooklyn, Pomfret, and Woodstock, an architectural feast surrounding a traditional town green. ♦ Creamery Brook Bison, Brooklyn (860-779-0837). How often can you meet a bison? Farm welcomes visitors for special seasonal events and fun. Great for kids and families. ♦ Connecticut Audubon Society Center, Pomfret (860-928-4948). Spend some time outdoors with Audubon — it wants you to meet the wilderness. 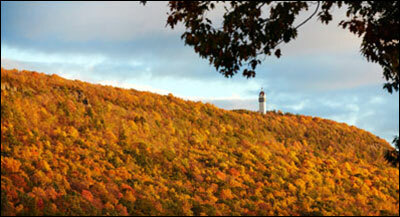 — Along this state scenic highway, travelers can see dramatic vistas from large hilltop farms. Three of those farms have been used by the same families continuously for almost 300 years. This route runs for 18 miles north to the Sterling Hill National Register Historic district. Offering views of fields and farms, it’s a great way for visitors to nearby Mystic in southeastern Connecticut and to extend their trip to northeastern Connecticut. ♦ Pachaug State Forest, Voluntown (860-376-4075). The Pachaug State Forest offers trails for hikers, snowmobilers, and horseback riders. This shoreline loop drive moves through the beautiful towns of Essex, Old Saybrook, Guilford, and Deep River, with stops at a marsh wildlife area and an ocean side state park. 35 miles. .
♦ Essex Steam Train and Riverboat, One Railroad Avenue, Essex. Enjoy a lazy ride up the lower Connecticut River in the lavish, antique railroad cars, then shift to a Mississippi-style river boat to complete your journey on the water. ♦ Hammonasset Beach State Park, 1288 Boston Post Road, Madison. 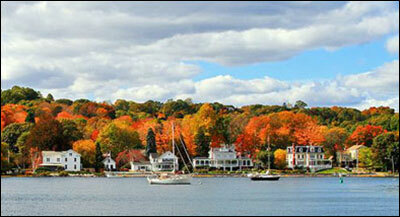 Connecticut’s largest shoreline park with lots of smooth beach for swimming and sunning, along with a fun boardwalk. ♦ Bishop’s Orchards, 1355 Boston Post Road, Guilford. Fun place to get out of the car, stretch, buy apples and pumpkins and autumn treats. Great for kids and families. ♦ On the way from Essex to Old Saybrook, you can take a short side trip eastward on Route 95 across the Connecticut River to Old Lyme and visit the Florence Griswold Museum at 96 Lyme Street. This marvelous house operated in the early 1900s as a boarding house for a summer colony of New York artists, and it’s a hot spot for American Impressionism. You will see lots of art and beautiful gardens. ♦ When you reach Hammonasset Beach State Park, swing northward on Route 450 for a stop in nearby Madison. There you will find a great bookstore, R.J. Julia Booksellers. Excellent book selection, gifts, kids activities, and special events. ♦ Penny Lane Pub at 150 Main Street in Old Saybrook is an English style pub and restaurant with a friendly, neighborhood atmosphere. Located on the state’s Signature Cocktail Trail. ♦ Bufalina at 1070 Boston Post Road in Guilford serves authentic Neapolitan pizza from a wood fired brick oven. Located on the state’s Pizza Trail. ♦ Chamard Vineyards at115 Cow Hill Road in Clinton has a very French-inspired bistro that serves lunch and dinner. Live music is presented on Friday through Saturday in the tasting room. Located on the state’s Wine Trail. ♦ The Wharf Restaurant at Madison Beach Hotel at 94 West Wharf Road in Madison serves fresh and locally sourced foods that spotlight the flavors of the Atlantic Northeast and New England. Eat in the dining room or on the year-round porch. — This drive takes you from the Long Island Sound shore and inland among salt marshes, classic town greens, sunflowers and a fine farm stand. If you’re coming from the New York/ New Haven area, take exit 53 off I-95 north. If you are coming from New York City, consider taking the Hutchinson River Parkway to the scenic Merritt Parkway (Route 15) as a substitute for I-95. ♦ About 4.5 miles east of Branford on Route 146, you might enjoy at small side trip to see shoreline where ferries depart for the Thimble Island cruises. Simply take a right turn at Take It for Granite Antiquities at 409 Leetes Island Road (which crosses Route 146) and head south on Thimble Island Road toward the village of Stony Creek. After a breath of sea air or an island cruise, return to Route 146 via Thimble Island Road. ♦ The Guilford green is a nice place to see a classic Connecticut town center. And the Guilford Art Center at 411 Church Street in Guilford may have something arty going on for your entertainment. ♦ Durham is the northern terminus of the loop, and from here, the directions below take you back southward. For a short trip for pick-your-own apples, sunflowers, baked goods, and a great farm stand, head a little north out of Durham along routes 17 to 147 to Lyman Orchards at 32 Reeds Gap Road in Middlefield. ♦ The shoreline is not the best place to see foliage, but if you love ocean beaches, you might want to swing over for a stop at Hammonnassett Beach State Park in Madison. Truly one of the state’s finest oceanside parks, with walk and a nature center. Talcott Mountin State Park is home to a wide variety of plants and animals. Distinct geographical formations date back to ancient times. It also is home to Gilbert Heublien’s unique summer estate, dating to 1914, which is open to the public. ♦ Heublein Tower, Summit Ridge Drive, Bloomfield (860-242-1158). Gilbert Heublein was a German hotelier and restaurateur in Hartford and a developer of gourment food. He built the Tower in 1914 as a summer vacation home for his family. The tower is open only in summer, but the property is accessible year-round for hiking and wildlife viewing.